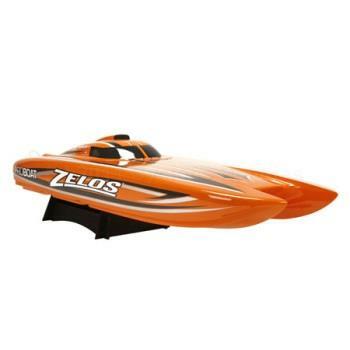 When it comes to RC boating, faster is always better, and you’ll be hard-pressed to find another boat that comes close to matching the speed, style and performance of the Pro Boat® ZelosTM 48 catamaran. As the fastest RTR in its class, the Zelos comes out of the box ready to deliver up to 55+ MPH of competition crushing speed. Equipped with an outrageous 1000Kv brushless motor and an ESC capable of handling up to 8S of LiPo power, this massive catamaran won’t shy away from delivering the pulse-pounding velocity you desire most. From its triple-layered fiberglass hull and distinctive trim scheme to its authoritative 1/5-scale high-torque servo, every aspect of the Zelos 48 design has been optimized to deliver superior performance while staying glued to the water. Get behind the throttle of the Zelos 48 today and ride a wave of speed, good looks, and competition dominating speed tomorrow.